After work Jim asked me to stop at the guard shack to big up packages he ordered from Camping World. They were large and didn't have room for them very long. So I did Matt put them in the car for me. When Jim got home he unpacked them. 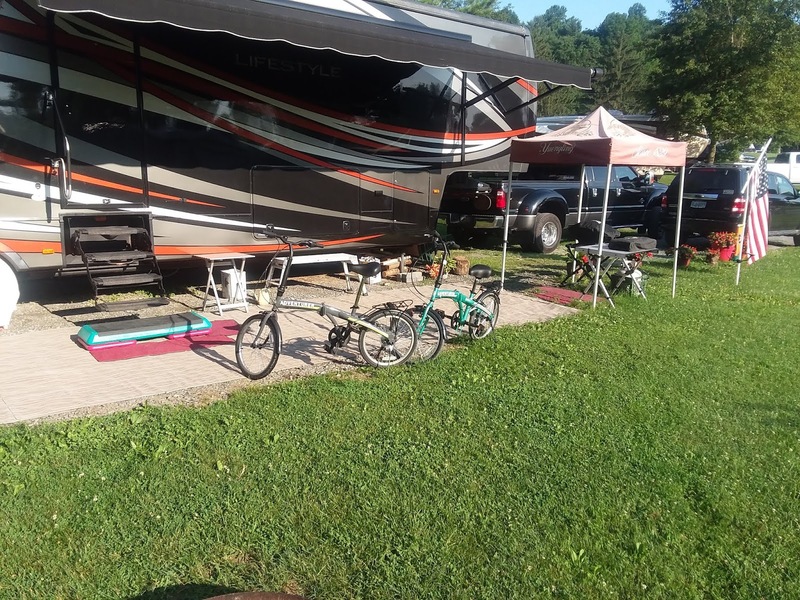 An adjustable folding metal table, grill cover and bike rack. We ate leftover smoked chicken soup loaded with veggies. After dinner Jim was playing with the stuff he ordered and it turned out the bike rack would not really fit right on the back of the FW. It was to close to back and the ladder, we wouldn't want it to touch it, and or rub. Starting to get hot, I watered all my flower pots. They do look nice, our 2 friends near by like looking at them when I'm not here and my car is not blocking there view. So I had to work late today till 8. But I'm able to get up a little after 7, relax and drink my coffee watching the Today Show, and I can do a few things and not have to rush around. I did keep the awning out to keep the sun off FW. Jim was going to be home around 2:30 but found out he never did make it home till 5, sometimes things have to go into overtime. People need there heat, AC, or hot water back on or what ever he is working on. So we chatted a little while I was on break, was a very busy day for me as usual. But when I got home, was so nice and relaxing Jim had a fire going, and we were both still a little hungry, so he grilled a couple of burgers, always ( turkey one for me ) We sat out by the fire and ate at the picnic table was SOOOoo nice. We really enjoyed it. This is the life, nothing better. It cooled off a lot when the sun started to set. So we slept in today as usual for a Saturday we don't work. I made us a smoothie and a little later 10ish I made us eggs and uncured bacon, and paleo Blueberry pancakes, wonderful, he loves it. Was getting hotter and hotter out. First we went to the bike shop in Cleona to see if it was worth fixing, the 2 older mountain bikes we had that used to be Jim's Dad's. Also we were going to return the bike rack, but we forgot it, so we have to do that later. 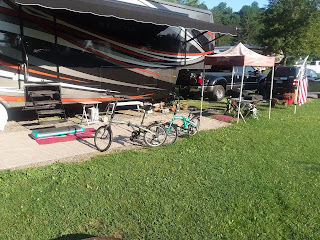 We were going to bring bikes back to CG if we didn't leave them at the bike place to be fixed, Well it turns out no they were not worth fixing so Jim felt no need to bring them back, was afraid they would get stolen out of the back of the truck in Harrisburg, now LOL he was wishing they would get stolen. We were trying to think of what our options were as far as the bikes, I said well we could just walk, or I really want a golf cart ie a " Cricket " a mini golf cart about 300 lbs folds down to move, so cute. We looked at bikes in " Bike " shop they were around 600 each, no way, we also thought of the folding bikes. The old mountain bikes needed everything to make them road safe, probably take 500 or more to fix them. SO we left there and headed to Camping World. 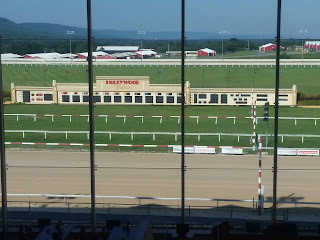 Not our favorite place, never have FW worked on there again, did our old one never again, long story. But ok to shop in the store or on line. 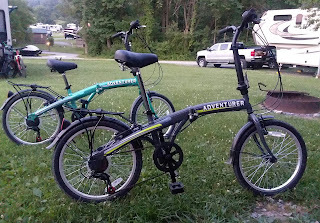 We looked around and at the folding bikes. We test drove them, had two nice young guys helping us, didn't know to much, but very nice and helpful. the gray one Jim was driving the gear kept clicking just was not right. One young guy went and got a new one in a box and they both very quickly put it together. 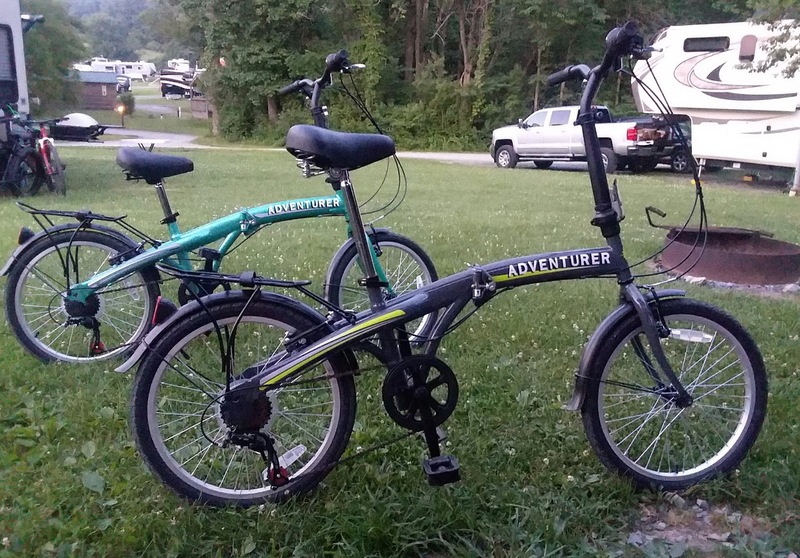 So we ended up with 2 new bikes for our anniversary. We parked far from the door because we had the truck and we road them over to the truck to leave, I went the long way. I have not road a bike in years, I'm always afraid of falling, so far so good. 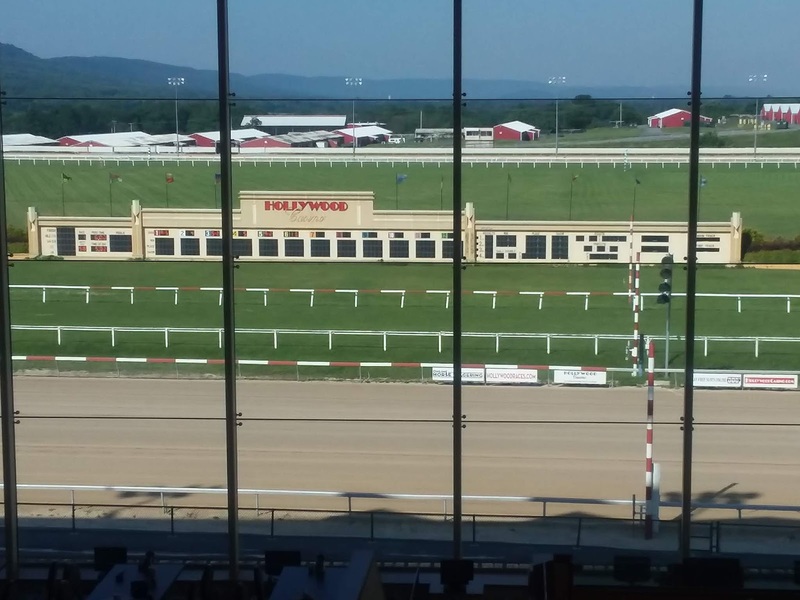 The we headed to Penn National Race Track, where we met. He was a waiter and I was in the kitchen making desserts. We worked in the nicest dining room there Mountain View Terrace. I was so young I was not allowed to use a knife to cut bananas to make banana splits. This guy had to for me I didn't complain I could have used a butter knife but I didn't say that, I liked him not Jim. But Jim grew on me I am with the best person I was ment to be with. We went to the same school but I didn't know him then. He knew who I was, he knew my younger brothers. We walked around, it looked different now and there is non smoking areas but smoke goes everywhere and we can only take it so long. They have really good pizza we shared a thick slice. We put a few bucks in a slot machine. People watched it was full. Had a drink and was soon time to head out.